The average six room home carries forty pounds of dirt/dust a year. All the air that you breathe in your home or office flows through the return air and supply air ducts/vents. 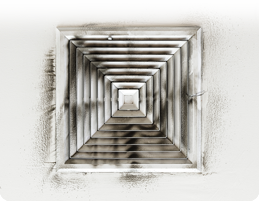 If these air vents are dirty, dusty, clogged or contaminated, you could be susceptible to more allergies, infections, unpleasant odors, and even higher utility bills. We suggest having an air duct cleaning every three years or less; and changing your furnace or return filter every month to reduce these risks. We use the Total Source Removal Method. We clean each air duct/vent from it’s opening. Each vent is cleaned individually from the opening all the way to the furnace/unit. We also clean the air handler portion of your furnace/unit and sanitize your system. The sanitizer kills air born mold and mildews for a year. We clean air ducts with a vacuum system and compressed air brushes. Some companies use the Single Brush Method, which as you can see by the diagram, touches the smaller size duct pipe, but misses the walls of Air Duct Cleaningthe larger duct pipe. Dust that remains adhering to the larger duct pipe walls will at some time break loose and filter back through, leaving the problem of dirty air worse than before. The Single Brush Method also brushes over debris, instead of, extracting it from your air ducts, leaving your air ducts clogged and air flow severely hindered. With our Multiple Air Brushing Source Removal Method, we are able to access and clean all sizes and types of ducting, loosening and dislodging dust and debris; as we extract it at the same time, leaving no dust to settle in. Also with our high power suction, we remove objects like bricks, lumber, bottles, animals, and cans from the deepest sections of duct work. Air Ducts in the slab are starting to be made of PVC pipe, but a lot of air ducts are made of metal. These metal air ducts have the capability to rust because of water problems in the duct system. Over a period of time, water problems ranging from an A/C coil over flowing because of a blockage in the pan to foundational problems, can cause the air ducts to rust. Here in Oklahoma, we have found that we have a lot of foundational water problems. And in turn, almost any home over the age of 20 years can have a rusting problem in the air ducts. There are some companies that are not willing, able, or equipped to clean rusty ducts with or without holes in the ducts. We are willing, able, and equipped to clean your system fully. Should your ducts in your cement slab be damaged or partially destroyed, we have the answer to having them repaired. Yes, there is an answer to having your air ducts repaired verses having to go overhead with your air duct system! We here at Black Hat Cleaning Services are ready to help you with all your air duct needs. We can quote a price over the phone without any hidden charges. Black Hat Cleaning Services quotes include everything needed to clean your system properly. If you know the number of vents(supplies and returns) in your home, Black Hat Cleaning Services can give you a quote over the phone without any hidden charges. We’ll count the number of vent openings when we arrive at your home before we even get started. And if we find a difference in the number of vent openings, there will be an adjustment to the price at that time. This way you will know exactly what your price is before the work is completed, not after. No hidden charges!